The decision comes after beekeepers in the heavily agricultural region Pomurje reported massive bee deaths. 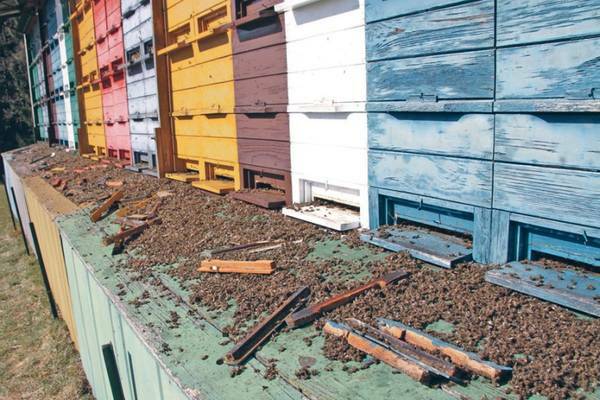 About 2,500 beehives kept by 45 beekeepers in Pomurje have been affected, Agriculture Minister Gregor Zidan told the press after the cabinet session. Lab analyses showed that in at least seven cases the most likely culprit was clothianidin, an insecticide used to treat corn seed. Samples of the treated corn have been sent to German labs to verify whether the corn had been treated properly. Clothianidin had been banned by the previous government in 2008 following a similar outbreak of bee deaths, but the ban was revoked by Zidan's predecessor Milan Pogacnik based on an analysis by the Chemistry Institute. Zidan said he would demand explanations on why the ban was revoked and then decide whether to take action against his predecessor. There is no data on how much seed corn has been treated with clothianidin. Joze Ilersic, the head of the Phytosanitary Administration, said than in 2008 a third of the seed corn had been treated with insecticide. Aside from a temporary ban on corn seed treated with neonicotinoids, the government decided to disallow the use of Biscay (based on thiacloprid) for the treatment of canola during blooming due to its possible synergy effects with other pesticides. Both clothianidin and thiacloprid are produced by Bayer Cropscience whose best selling product is the neonicotinoid imidacloprid, also linked to honeybee decline. Slovenian beehives in Pomurje after exposure to the neonicotinoid clothianidin applied as seed coating in corn, April 2011. The new EU prescription to put deflectors on pneumatic sowing machines to avoid dust drift of the poison did not protect these bees. The use of clothianidin is also allowed in the Netherlands under the names Poncho Rood for corn and Poncho Beta for sugar beet. UPDATE4 May 2011: Slovenian farmers called on the government on Wednesday to reverse its ban on corn seeds treated with neonicotinoid pesticides due to a lack of a conclusive link between recent bee deaths and the seeds. But Agriculture Minister Dejan Zidan said this was not an option. Italiaans moratorium op neonicotinoiden voor zaadbehandeling opnieuw verlengd.